Is pet insurance a good idea for you? Many pet owners debate whether or not to purchase a pet insurance policy. The cost of dogs, cats, and other pets can be high, but is pet insurance worth it? What does it cover? How much will it cost? Take the time to research options and gather information to help you make an informed decision. Most pet insurance works in a similar way to auto insurance. You select a coverage plan and pay a monthly premium. You typically have the option to choose whether your plan covers most health issues, only major illnesses, or something in-between. The monthly rate varies based upon the coverage selected. Other rate factors include your pet's species, age, breed, and reproductive status. It is important to know that, in general, veterinarians do not directly process pet insurance. You and your veterinarian work together to make decisions about your pet's medical care. The insurance company has no involvement at this point. You pay the bill yourself and then submit the claim to your insurance company. Your vet can provide the insurance company with medical records when necessary. If covered, the insurance company reimburses you for a percentage of the bill (based upon your plan's coverage). This requires you to have cash or credit available to pay your vet bills while waiting to get the money back from the insurance company. Therefore, planning ahead for emergencies is still necessary. Pet insurance is a good idea in some cases. Many pet owners without insurance find themselves regretting it when a pet becomes sick or injured. Pet insurance can help you save money on veterinary expenses, but it still costs money up front. If one were to add up the cost of pet insurance premiums and veterinary bills after reimbursement over the life of a pet, then compare it to veterinary bills alone with no pet insurance reimbursement, the value would vary for each pet. In general, you may spend more on pet insurance or break even if your pet is extremely healthy during his life. On the other hand, if a pet that has many injuries or illnesses over the course of his life, pet insurance can mean major savings for owners. It's a bit of a gamble. Pet insurance premiums start as low as about $5 to 10 per month and can go as high as $100 to $150 or more monthly. Lower cost plans typically have higher deductibles and may cover fewer procedures or pay a lower percentage of vet costs. Higher cost plans often have lower deductibles and may cover as much as 80-90% of your vet bill. Not all plans cover wellness and preventive care. However, pet owners usually find pet insurance very helpful when unexpected veterinary costs arise. If the insurance plan you choose does cover wellness and preventive care, it may be an especially good deal. 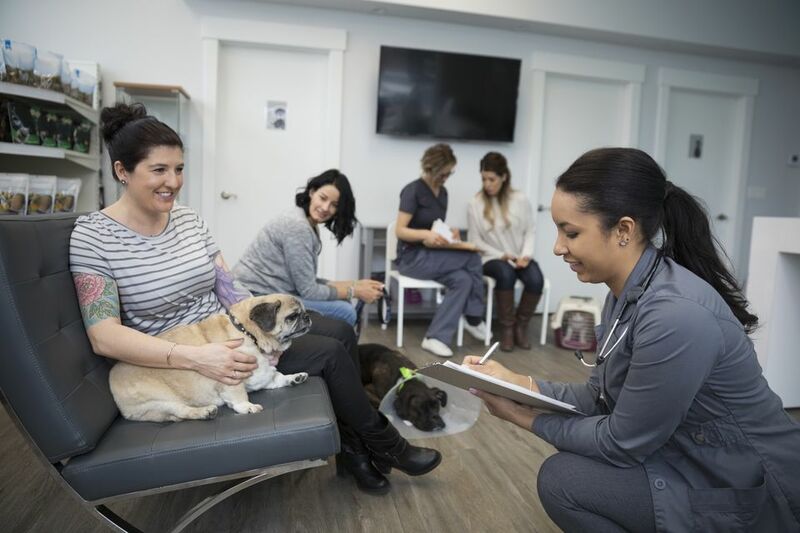 Consider that routine veterinary services and preventive products may cost about $300-1500 per year depending on the species, age, and size of your pet. Remember, this does not count unexpected illnesses and injuries. Pet insurance is not just for older, sickly pets. Getting a pet insurance policy for a young, healthy pet can be quite affordable. It may be especially worth the cost if the plan covers routine things like wellness exams, vaccines, lab work, and preventive care. In fact, getting your young pet started on an insurance plan early may help keep premium costs down over time. Some companies even lock-in the premium cost when you sign up, making it a real money-saver down the road. Start a savings account specifically for pet expenses. Choose one without fees if possible. If you can find one with a high interest rate, you can even save a little extra money. This is really the best option for vet cost planning because it will not limit which vet you can see and it will not cost you any extra money. Apply for a line of credit through a company like CareCredit. Be aware that not all vet clinics accept these plans, so do your research in advance. Or, if your financial situation permits it, open a regular credit card intended for use only on pet care expenses. Choose a veterinarian that offers wellness plans. These plans usually require a down payment, then a monthly payment so you can spread out the cost of your pet's routine care over time. However, know that you will be limited to that vet/chain to get services under the plan. In addition, these plans are not created to cover illnesses or injuries. Sign up for a program like PetAssure. You pay a membership fee to get a discount at participating vet offices for all services. Just make sure those participating clinics are in your area and to your liking.